Poly v belt tensioner Ford Transit MK7 fits the model produced in 2006-2013. The tensioner used in diesel engines with a capacity of 2.4 TDCI. The tensioner is a roller included. Set is mounted to the engine. efficient tensioner is responsible for proper belt tension. 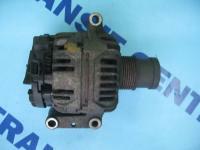 Ribbed belt drives the engine equipment or between different water pump, alternator. V-ribbed belt tensioner has been made by Trateo. The company is a leading manufacturer of parts for vans. It puts the high quality of the workmanship of their products, so you can guarantee their reliability.